Completed Projects for His Kids Too! for 2008 | His Kids Too! 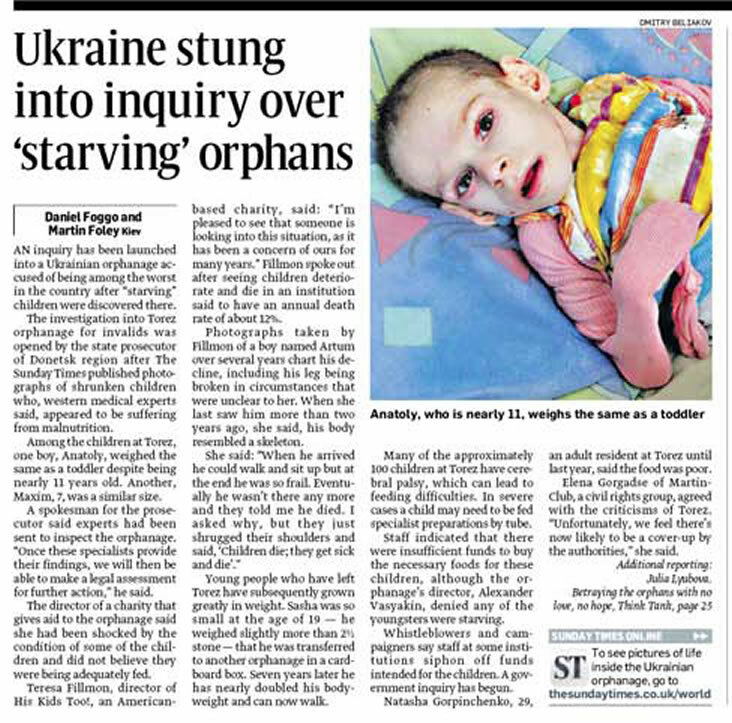 Orphan children in Ukraine receive nothing for Christmas. There are no government funds for gifts, a special meal, not even a Christmas tree. After contacting Samaritains Purse asking for assistance for orphans, and receiving none, we decided to take the project on ourselves. Volunteers were asked to gather gift boxes. Plastic show boxes were filled with personal care items (shampoo, conditioner, lotion, toothbrush and paste, floss, chapstick), small toys, slippers, socks, art supplies, anything that would fit in the box. Boxes were labeled for gender and age appropriateness. Volunteers traveled to Ukraine December 28, 2006 – January 12, 2007 to hand deliver these boxes to over 1000 orphans. Linda Goodnight,, Mac and Linda McCorvey, Carolyn Holifield, Heidi Hartman, Angie Welch. His Kids Too! saw the need for personal care bags for orphans many years ago, and created a program to provide orphans personal hygiene products when they enter the system. Each gallon sized ziplock bag contains: toothbrush, toothpaste, dental floss, shampoo, conditioner, lotion, soap, wash cloth, comb or brush, socks, chapstick, school supplies, and a toy. A total of 1000 bags were filled (and distributed) with these items, along with clothing. Coat drive – Winters are harsh in Ukraine, and good quality coats are a must. His Kids Too set a goal of 400 coats for orphans, and surpassed that goal in one Sunday. A total of 600+ coats were purchased, shipped and subsequently given away in Ukraine, fall of 2008. Ukraine, overall, is not a Christian nation. Since becoming its own country in 1991, Ukraine has struggled with religious freedom. In 2000, after much negotiation with local officials a group of Christians were permitted to teach ‘good moral lessons’ to children in Ukraine. The first 2 years, this was done with school children, through this group. In 2003, Teresa Fillmon asked and received permission to include orphans in the summer camp. 2003 was the first year to introduce Bible lessons to the local orphans in the city of Dzerzhinsk Ukraine. – His Kids, Too! camp for orphans and needy children was held in the city of Dzerzhinsk Ukraine. Coordination of this was done with local education officials and the mayor. Children were fed breakfast and lunch daily, and provided with moral lessons, using the Bible as their handbook. Each child was given an age appropriate Bible, and crafts for each day of lessons. Additionally, children were given gifts from teachers, and staff. A team of 38 Americans and Ukrainians were assembled to translate, and present lessons to the children. Twenty Americans traveled from the U.S., to Kyiv and then traveled by train to Dzerzhinsk, traveling the remainder of the way by local transport. They lodged in local homes, and at the orphanage. All meals were provided for the team, in addition to transportation and interpreters. this is a long term project, and our plan is to return annually to present this Bible camp to this facility and branch out to other local facilities. The local church is involved with this project, and when they are able, they visit the orphanage for follow-up Bible classes. Raa Middle School collects 20 boxes of clothing and $2540.00 in funds. Volunteers were asked to gather gift boxes. Plastic show boxes were filled with personal care items (shampoo, conditioner, lotion, toothbrush and paste, floss, chapstick), small toys, slippers, socks, art supplies, anything that would fit in the box. Volunteers traveled to Ukraine December 28, 2008 – January 11, 2009 to hand deliver these boxes to over 1500 orphans.